Growing up I became infatuated with British entertainment. I blame primarily a love of James Bond movies, I wonder why I like S.H.I.E.L.D? And there was a prominent long-running British sci-fi show I loved as a kid but whose name will not be spoken. My love of British things was so impactful that my master’s degree focused on British military history. But other than reading some Excalibur as a kid and the occasional bump into Peter Wisdom my Marvel UK experience was shallow. So I was pretty excited when I saw the multi-author, multi-artist compilation of Revolutionary War. I planned to read just for fun, but then Agent Keller walked in! Great Britain is under attack, the formally defeated Mys-Tech with its ruling immortals who combine magic and science are rising again. 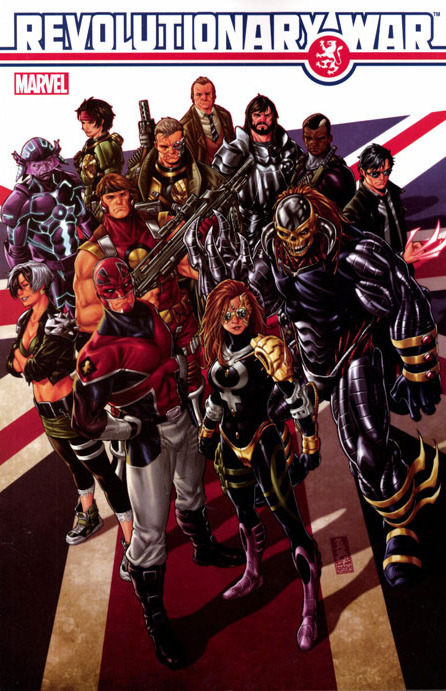 Captain Britain recruits Pete Wisdom into the European Division of S.H.I.E.L.D. to recruit Britain’s greatest heroes to take a stand against evil and the conquest of Great Britain. The story moves through the lives of numerous British heroes like the Super Soldiers, Death’s Head I and II, the Knights of Pendragon, and the Warheads. Some heroes are betrayed. Some heroes change allegiances. And in the end Britain’s heroes face Mys-Tech’s champion in a giant battle royale! I feel like Revolutionary War is a love letter to Marvel UK. Writers Andy Lanning, Alan Cowsill, Kieron Gillen, Rob Williams and Glenn Dakin combine to reintroduce Marvel’s heroes into the Marvel 616. They combine with numerous artists including Rich Elson, Dietrich Smith, Will Sliney, Nick Roche, Brent Anderson, Tom Palmer, Ronan Cliquet and Gary Erskine to provide installments of what feels visually like an integrated story. I have recently read two installments of Mutliversity, which I know will combine into one story line. But it feels at the moment like stand alones. Despite the numerous authors and artists, Revolutionary War still feels and reads as a complete tale. Agent Keller is the key S.H.I.E.L.D. agent in the story. Keller had crossed Agent Hill and got demoted to Europe. I personally need to find a way to cross my boss in the future if that is the sanction I get. And despite Keller getting pushed into the background, he is a key character to the story. Additionally, we discover that S.H.I.E.L.D. has been recruiting, including Britain’s most visible hero, Captain Britain. S.H.I.E.L.D.’s headquarters are not a hellicarrier. No, Keller is based out of the Museum of Pagan Antiquities. And if feels like a perfect base for S.H.I.E.L.D. since this story combines science and magic. If anything we could use that mix in Secret Avengers! As an American reader there is some background lost on me. I have read Captain Britain in Excalibur and other American appearances. But his British appearances are something lost on me. I have read one of the Death’s Heads in an Iron Man story, but it is hard to keep track of which one. And I am not familiar with Mys-Tech or the Battle of London Bridge. The histories of most of these heroes is also something I am not familiar with. In the end, there is background lost on me. I am sure I do not get the whole plot. So I looked at this story as an introduction to Dark Angel, Colonel Liger and Dai Thomas. I still enjoyed the story without knowing their histories. And I would like to read some more! S.H.I.E.L.D.’s London office is open for business! And S.H.I,.E.L.D. proves that it is there to preserve Europe’s freedom…or maybe some other super team will step up if Marvel does not open the office again soon!